Bure Valley Railway – An 18 mile round trip in the Norfolk countryside. Ravenglass & Eskdale Railway–“The Ratty” Need we say more. 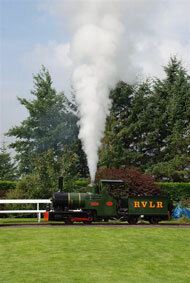 Evesham Vale Light Railway – A 15" gauge Steam Railway in the Vale of Evesham. Welshpool and Llanfair Light Railway –- A 16 mile return journey by narrow gauge steam train through beautiful Mid Wales countryside. Romney Hythe and Dymchurch Railway – A 15-inch gauge working railway with a fine fleet of one-third scale steam and diesel locomotives. Below you will find a list of our Suppliers, without them none of this would be possible.